The upcoming release of a Ferrari-branded game on the PlayStation Network, combined with the expiration of Sega's licensing deal with the Italian car manufacturer, means Outrun Online Arcade just became an Xbox 360 exclusive. This licensing deal is the key to the game's disappearance, as the latest Outrun game featured several authentic Ferrari cars; lose the license for those cars - as Outrun has - and you lose the license to sell the game. Which is exactly what's happened. 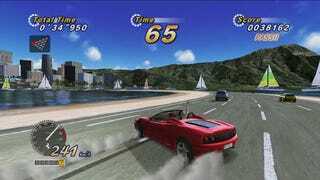 A new game called Ferrari: The Race Experience was released on the European PlayStation Network last week, and ever since, the PS3 version of OutRun Online Arcade has been unavailable for purchase. If you've got it, you can still play it, but if you don't have it, well...unlucky.